A spinal fusion is a surgery to weld together 2 or more vertebrae. Vertebrae are the bones that make up the spine. There are several different types of spinal fusions based on factors, such as the part of the spine involved, placement of the incisions, and the parts of the vertebra that are initially fused. All fusion surgeries include the use of a graft that is made of bone material. It stimulates healing and encourages the 2 bones to heal together into one solid bone. The graft may be a piece of bone from the hip, a piece of bone from a cadaver, or artificial bone material. Spinal nerves exit the spine between the vertebrae. Damage to the vertebra and the disc that sits between them can put extra pressure on these nerves. The irritated nerves can cause pain and weakness in the areas of the body affected by the nerve. Spinal fusion may be considered if all other methods of treatment (medication, rest, physical therapy) have not been able to relieve pain or disability. A spinal fusion removes damaged tissue and locks the 2 vertebra in place to prevent irritation of the spinal nerve between the vertebrae. Eat a light meal the night before surgery. Avoid eating or drinking anything after midnight. General or spinal anesthesia may be used. With general anesthesia, you will be asleep. Spinal anesthesia will numb an area of your body, but you will be awake. Posterior lumbar interbody fusion (PLIF)—the incision is made in the back. To access the spinal bones, the surgeon must move muscles and nerves out of the way. Part of the spinal bone covering the spinal column, called the lamina, may be removed so the surgeon can access the area between the vertebra. The cage is inserted from the back of the spine. Transforaminal lumbar interbody fusion (TLIF)—the incision is made from the side. This allows access to the vertebra without a lot of movement to the muscles and nerves. It also does not require removal of any bone covering the spinal column. Anterior lumbar interbody fusion (ALIF)—the incision is made in the lower abdomen. Organs and blood vessels are moved aside so that the surgeon can access the vertebra. The muscles and nerves of the spine do not have to be moved. The cage is inserted through the front part of the spine. No surgery is done on the outside of the vertebra. Another option called posterolateral fusion starts the fusion on the outer surface of the vertebra. An incision is made in the back. The muscles are pushed aside to access the vertebra. Damaged bone and structures may be removed to relieve pressure on spinal nerves. A graft material will be placed along the outside of the vertebra to encourage bone healing and growth, and stimulate the fusion. Titanium screws and rods may also be used to help stabilize the bones while they heal. This option may also be used to treat scoliosis. With all surgeries, the incision will be closed with stitches or staples. 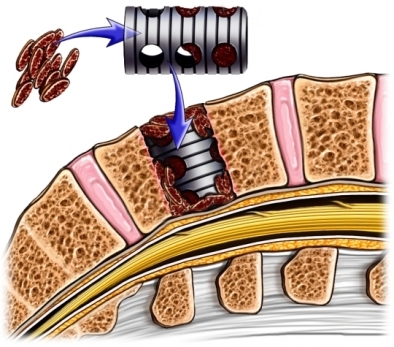 A metal cage filled with bone graft is placed between lumbar vertebrae. It will take several months to a year for the bones to fully fuse, but symptoms may improve earlier. During recovery, it is important to follow posture and activity recommendation to help the bones stay in proper alignment. Certain activities like heavy lifting, twisting, or strenuous activities will need to be avoided during recovery. Assistance with daily activities may be needed. Physical and occupational therapists can demonstrate how to do certain activities without placing stress on the back. Some limitations may need to be followed even after recovery. The fusion will limit some flexibility of the spine but the difference should not make a significant impact on daily activities. Time off from work ranges from 4-6 weeks to 4-6 months. The length of time depends on your age, overall health, and the physical demands of your job. Following your rehabilitation program will speed your recovery and reduce discomfort. Anterior lumbar interbody fusion. Ortho Info—American Academy of Orthopaedic Surgeons website. Available at: https://orthoinfo.org/en/treatment/anterior-lumbar-interbody-fusion. Updated January 2016. Accessed December 18, 2017. Chronic low back pain. EBSCO DynaMed Plus website. Available at: http://www.dynamed.com/topics/dmp~AN~T116935/Chronic-low-back-pain . Updated June 30, 2017. Accessed December 18, 2017. Kim CW, Siemionow K, Anderson DG, Phillips FM. The current state of minimally invasive spine surgery. J Bone Joint Surg Am. 2011;93(6):582-596. Posteriolateral fusion. Laser Spine Institute website. Available at: https://www.laserspineinstitute.com/back%5Fproblems/back%5Fsurgery/types/posterolateral. Accessed December 18, 2017. Posterior lumbar interbody fusion and transforaminal lumbar interbody fusion. Ortho Info—American Academy of Orthopaedic Surgeons website. Available at: https://orthoinfo.aaos.org/en/treatment/spinal-fusion-plif-tlif. Updated June 2010. Accessed December 18, 2017. Spinal fusion. Ortho Info—American Academy of Orthopaedic Surgeons website. Available at: https://orthoinfo.aaos.org/en/treatment/spinal-fusion. Updated June 2010. Accessed December 18, 2017. Spine surgery: Lumbar interbody fusion. Hospital for Special Surgery website. Available at: https://www.hss.edu/conditions%5Fspine-surgery-lumbar-interbody-fusion.asp#.VJMAvsAKA. Updated May 9, 2011. Accessed December 18, 2017.